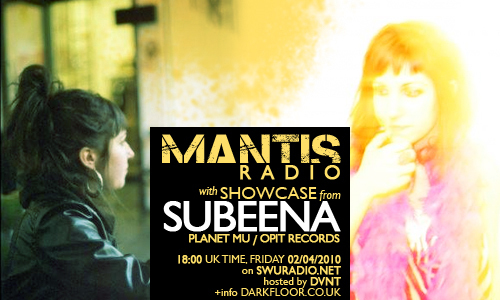 Mantis Radio presents Planet Mu’s Subeena. Plus, music from Buckfunk 3000, The Black Dog, Molez, Breakage, Alva Noto, SCB, and more. Subeena is 24 years old producer Sabina Plamenova, originally from Italy via Germany with Bulgarian roots, now based in London where she studies a Music and Media degree. Subeena was included in a special feature dedicated to women in electronic music called ‘X chromosome‘ by Mary Anne Hobbs on BBC Radio 1, where she showcased her own special sound on the airwaves amongst other producers such as Ahu, Vaccine, Cooly G, Ikonika and more. Her productions have also had wide support amongst internationally renowned producers such as Skream, Boxcutter, Vaccine, Mrs Jynx, Jay Scarlett, Mike Slott, Tes La Rok, Dave Q from Dub War and many more. Her work was initially mainly included in the dubstep niche, however it has quickly evolved and has become more diverse, crossing over various “electronic music” genres but at the same time not losing that distinct sound in which Subeena began experimenting with. She runs a monthly 2 hour radio show on Sub.FM called ‘Outland’ which includes guest mixes from producers from across the globe. Sabina took part at the latest Red Bull Music Academy held in Barcelona in autumn 2008, where she collaborated with artists such as UK singer-songwriter Jamie Woon, Mexican producer Pepepe and MC and producer Violet who she also included in her new EP, and with studio team Osborne and Om Mas Keith (Sa-Ra). The collaboration with Jamie Woon and Om ‘Mas Keith– Solidify is included in the Various Assets CD that the Academy releases every year and that features the productions made during the two terms; it was also released on Planet Mu Records in October ’09. Featured on one of the past editions of the free DVD Slices together with producer Dot, who she has been co-running her own record label Imminent Recordings (formerly known as Immigrant Recordings) for a year and a half.